Science Bowl is a quick-paced Jeopardy-style competition with questions from all areas of science: Biology, Chemistry, Physics, Earth and Space Science, Mathematics, and Energy. It is run by the United States Department of Energy and consists of regional and national events. 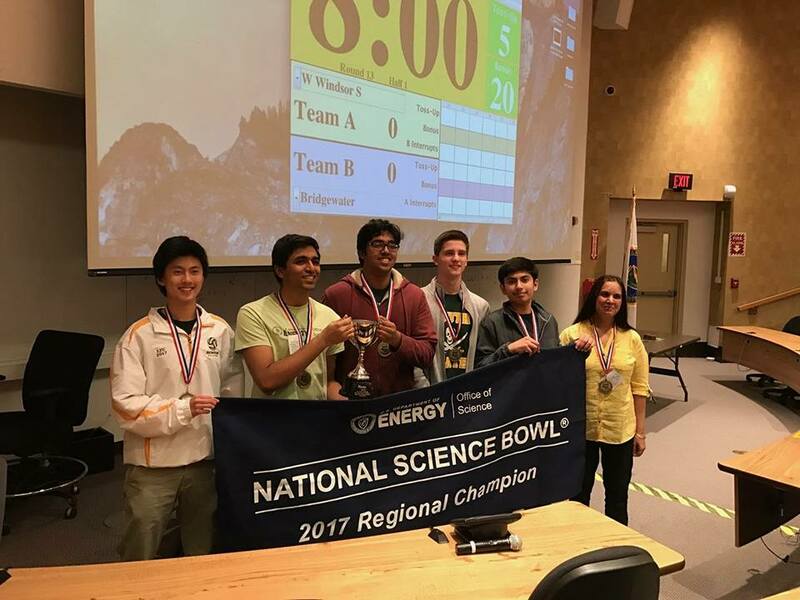 The WW-P South Science Bowl team is very successful, holding the best statewide record in 2015, 2016, and 2017, placing 1st each year in the regional competition, and winning a $1000 school grant from each trip to Nationals. A game of Science Bowl consists of two teams of five (four playing, one alternate) racing against one another to answer two types of questions: toss-up and bonus. All questions are read out loud and must be answered within a certain time limit - five seconds for toss-up questions and twenty for bonus questions. Toss-up questions, worth 4 points, can be answered by an individual from either team, but no communication between team members is allowed. Bonus questions, worth 10 points, can only be answered by the captain of the team that gets the toss-up question right. A typical game consists of two halves, each with either a 8, 10, or 12-minute time limit, depending on the level of play. The team with the highest score wins. Competition usually involves a round-robin session followed by a double-elimination bracket. The regional competitions are held at the Princeton Plasma Physics Laboratory (PPPL), and the national competitions are held at the National 4-H Conference Center in Washington D.C..
For more information regarding Science Bowl, you can visit the official National Science Bowl website. The best way to prepare for Science Bowl is simply to read a lot about whichever topics that interest you (Wikipedia is a great resource). There is no formula for the "ideal player", but the best players generally have a solid understanding of all the subjects but are especially strong in two or three of them. Tryouts occur continuously, beginning around October and ending around January. Tryouts are open to anyone who is interested, and is always a great experience. Traditionally, approximately 30 - 40 people try out, 16 - 20 make it through the first round, and from there, the final 10 are selected to compete with either the A or B team. Tryouts and practices are generally held on Fridays after school. More information regarding tryout dates will be available as the season progresses.